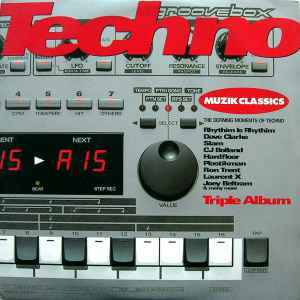 Photography [Front Cover Photo Supplied By] – Roland (UK) Ltd.
"The Defining Moments Of Techno - Triple Album"
℗ 1999 Beechwood Music Ltd.
© 1999 Beechwood Music Ltd. Distributed by Beechwood Music Distribution via BMG (UK) Ltd.
Also available in the serie Drum & Bass Muzik Classics. In 1999 my Dad brought me a pair of Numark belt drive turntables for Christmas, with it came two LP's purchased from the late, great Selectadisc in Nottingham. One of these compilations being this amazing sonic soundscape into 90's Techno. Can't think of many better compilations still to this day! !